What changes will make the 2020 Jeep Grand Cherokee different? Likely little of consequence as this midsize crossover SUV awaits a ground-up redesign for model-year 2021. Jeep’s flagship SUV will return for ’20 as a five-seater with an unusually broad model bandwidth: tame six-cylinder versions; plush wood-and-leather editions; the off-road-conquering Trailhawk; and the rip-roaring 707-horsepower Trackhawk, the world’s most powerful SUV. Jeep is even expected to again offer a diesel model. Grand Cherokee was last fully redesigned for model-year 2011. It got freshened styling and mechanical updates for 2014 and added standard safety features and a snazzy Limited X trim for model-year 2019. With roots in Mercedes-Benz engineering (the companies were corporate cousins from 1998-2007), the Grand Cherokee also shares many mechanicals with parent-company Chrysler’s Dodge Durango, which stretches the structure to accommodate a third-row seat. There’s speculation the Durango will be discontinued around model-year 2022, to be replaced by a seven-passenger version of the next-gen Grand Cherokee. 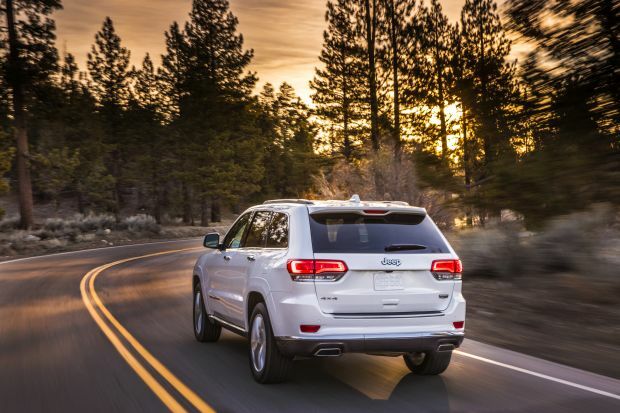 Although sales are down about 8 percent through October 2018 (in a segment up 2.8 percent as a whole), Grand Cherokee remains a strong performer. It trails only the Ford Explorer and Toyota Highlander in the class and is America’s best-selling five-passenger midsize crossover by a wide margin. That’s remarkable, considering it’s among the oldest designs in its competitive set. It speaks to the strength of the product, to the appeal of the Jeep brand, and to Jeep’s wisdom in creating that broad bandwidth. Buy a 2019. It has a few notable feature updates and will save you some money over what’s almost certain to be the virtually unchanged 2020 Grand Cherokee. Choosing a ’20 gives you just one model year before the redesign makes your Grand Cherokee look and feel dated. Expect the ’20 to mirror the ‘19’s core model lineup. It should start with the entry-level Laredo trim and ascend through the volume-selling Limited, the off-road-oriented Trailhawk, the luxury-themed Overland, and the flagship Summit. The high-performance SRT and Trackhawk models should also return. Also expect Jeep to continue with a plethora of specialty variants, although it could pare back a bit as it closes out the 2011-2020 generation. On the other hand, it may field a special edition to commemorate the conclusion of this highly successful Grand Cherokee design. For 2019, the variants were the Laredo E and the Altitude, High Altitude, Limited X, and Upland. They’re primarily appearance packages for the Lardeo and Limited grades but are priced as separate models. Frankly, buying either a 2019 or a 2020 Grand Cherokee will get you a vehicle that’s ancient by automotive standards, even if it has aged well. If you can wait, it might pay to hold off until more details emerge about the next-gen replacement. The 2011-2020 Grand Cherokee was derived from the 2006-2011 Mercedes M-Class SUV. Chrysler and its Dodge, Jeep, and Ram truck brands were acquired by Italian automaker Fiat in 2009. Fiat also owns Alfa Romeo and Maserati and the 2021 Grand Cherokee will move to the same platform that underpins the Alfa Romeo Stelvio, a midsize premium crossover with world-class road manners. As the name crossover implies, the Grand Cherokee will remain a unibody design with carlike construction that integrates body and frame as one unit. Jeep’s 2021 model lineup is also expected to add a truck-like body-on-frame SUV with a name resurrected from the brand’s past: Wagoneer. This full-size three-row SUV will compete with the likes of the Chevrolet Tahoe and Ford Expedition while an ultra-luxury version dubbed Grand Wagoneer would answer the Cadillac Escalade and Lincoln Navigator. Don’t count on it. With a redesign in the wings, it’s improbable Jeep would change the look of the ‘20 Grand Cherokee in any meaningful way. Expect every variant to again sport some unique styling elements, but the fundamentals will remain the same. You’ll find the brand’s trademark seven-slot grille and LED daytime running lights. The front fascia will retain a variety of treatments depending on the trim level or appearance package, from chrome outlines on the Summit to blackout on the SRT. The Trailhawk will again employ red-painted tow hooks under the front bumper as a functional style marker. The Trackhawk will reprise a massive lower air intake to guide fresh air to its musculare engine (more on that in the next section). The profile and rear-end styling will remain generally the same across the board, though there are a few key differences depending on how fancy or fast you want to go. Again, the Trackhawk will stand out for its massively flared wheel arches, huge brakes with painted calipers, and prominent quad exhaust outlets. The ’20 Grand Cherokee’s cabin should remain a model of simplicity and functionality. For 2019, the available 8.4-inch Uconnect infotainment system with imbedded navigation, Apple CarPlay, and Google Android Auto received an upgrade with higher resolution graphics and support for smartphone-style gestures. It also became standard equipment on Limited and higher models. Uconnect supports a customizable home row where the driver can put the most commonly used functions together for easy access. The only real downside to it is that there are no separate physical buttons for the available heated and ventilated seats and heated steering wheel. These features can only be controlled via the Uconnect interface. Passenger comfort will remain a highlight. Non-performance grades have cushy, supportive seats with plenty of room front and rear. SRT and Trackhawk get highly bolstered sport bucket chairs up front that might confine wider folks. Cargo volume will remain mid-pack at 36.3 cubic feet behind the rear seatbacks and 68.3 with them folded. Only if Jeep discontinues any of the five available engines in advance of the redesign, though we believe that’s unlikely. Hardly any vehicle of any stripe matches Grand Cherokee’s powertrain variety. Expect the ’20 Laredo, Limited, Trailhawk, Overland, and Summit to again come standard with a 3.6-liter V-6 of 295 horsepower and 260 pound-feet of torque. They’ll have adequate acceleration and you’ll have no worries pulling away from a stop or merging into fast-moving highway traffic. Jeep hasn’t been plagued with the emissions-regulation woes that shelved the diesel engines offered by some rivals it may well continue to offer a 3.0-liter turbocharged diesel V-6 in the 2020 Grand Cherokee. The automaker said the engine would return for model-year 2019 as a late-availability option. It’s been available on Limited, Trailhawk, Overland, and Summit trims and if it returns it’ll again have 240 horsepower and a robust 420 pound-feet of torque. The turbodiesel is the engine you want if you plan to tow with any regularity. Selecting it gives the Grand Cherokee a maximum trailering capacity of 7,200 pounds with AWD or 4WD and 7,400 pounds with rear-wheel drive. The Fiat-designed turbodiesel is smooth-running, doesn’t smoke or smell, and has only a hint of characteristic diesel clatter noticeable at idle when you’re standing outside the vehicle. Chrysler’s 5.7-liter Hemi V-8 should return as a popular option for the 2020 Trailhawk and AWD/4WD versions of the Limited, Overland, and Summit. It’ll return with 360 horsepower and 390 pound-feet of torque. Grand Cherokee and Durango are the only non-luxury-brand midsize crossovers to offer a V-8. With great pick-up off the line and satisfying thrust throughout the speed range, the Hemi V-8 is a fine choice if you relish a muscular exhaust note but aren’t as keen on the extroverted styling of the SRT or Trackhawk. This 5.7-liter V-8 matches the turbodiesel for towing capacity but trails it significantly for fuel economy, as you’ll see below. 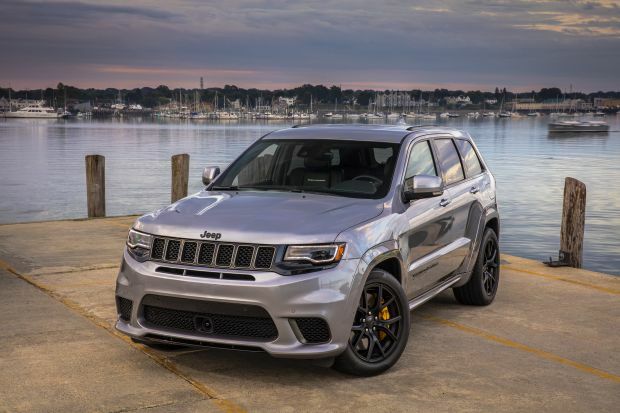 At the super-performance end of the spectrum, the 2020 Grand Cherokee SRT will return with a 6.4-liter Hemi V-8 of 475 horsepower and 470 pound-feet of torque, good for 0-60 mph in 4.3 seconds. A step beyond is the Trackhawk. It packs a 6.2-liter supercharged V-8 with a mammoth 707 horsepower and 645 pound-feet of torque. Despite their muscle-car credentials, both the SRT and Trackhawk are well-mannered around town and devilish when you open the throttle. Despite a 5,363-pound curb weight, the Trackhawk will do 0-60 in 3.5 seconds – its AWD grip making it quicker than the rear-drive-only Dodge Challenger Hellcat coupe with the same engine. V-6 and turbodiesel versions of the 2020 Laredo, Limited, Overland, and Summit should again come standard with rear-wheel drive and continue to offer a choice of all-wheel drive (AWD) or full-time four-wheel drive (4WD). Models with the 5.7-liter V-8 will come with 4WD. Called Quadra-Trac I, the AWD system maintains a 48/52 front/rear torque split. for added traction over wet or snowy roads. More capable off-road is Quadra-Trac II. Likely to remain optional with the gasoline and diesel V-6s, and coming standard with the 5.7-liter V-8, this 4WD system can remain left engaged on dry pavement and includes low-range gearing for off-roading. Look for the even more proficient Quadra-Drive II 4WD system to remain optional with the 5.7-liter V-8 and the diesel. It includes low-range gearing, an electronic limited-slip rear differential, and Jeep’s Quadra-Lift air suspension, which is adjustable to increase ground clearance to 10.8 inches, from the standard 8.6 inches (it can also lower the vehicle for easier access when parked). The Quadra-Trac II and Quadra-Drive II systems should again come with Jeep’s Select-Terrain traction-control system that allows the driver to choose from powertrain settings calibrated to afford maximum traction in snow, sand and mud, or rock, along with a sport setting that enlivens the vehicle’s response a notch. The 2020 Trailhawk will remain 4WD only while the SRT and Trackhawk will again feature specific, performance-oriented AWD systems engineered to maximize on-road handling. On the road, the mainstream Grand Cherokees will remain highly competent, with an impressive blend of ride quality and handling performance that belies their Mercedes-Benz DNA. SRT and Trackhawk have taut, handling-tuned suspension and tires for sport-sedan levels of grip and corning ability. 4WD and their standard 8.6 inches of ground clearance, the other models are exceedingly capable off road and a credit to Jeep’s go-anywhere heritage. An air suspension standard on Trailhawks, Overland, and Summit and optional on the Limited provides a maximum 10.1 inches of ground clearance. The purpose-designed Trailhawk is particularly impressive for its rugged-trail prowess with little sacrifice in daily drivability. With no powertrain changes, all 2020 Grand Cherokees should repeat their 2019 EPA ratings. With the 3.7-liter V-6, expect ratings of 19/26/21 mpg city/highway/combined with rear-wheel drive and 18/25/21 with AWD or 4WD. Models with the 5.7-liter V-8 and standard 4WD should again rate 14/22/17 mpg. Expect the ’20 Grand Cherokee SRT to rate just 13/19/15 and the Trackhawk a sobering if-you’ve-got-to-ask 11/17/13 mpg. Ratings for the 2019 diesel engine were not available in time for this report but anticipate a repeat of the 2018 ratings: 22/30/25 mpg with rear-wheel drive and 21/18/24 with AWD or 4WD. The 3.6-liter V-6 would again use regular-grade 87-octane gasoline. Jeep will continue to recommend mid-grade 89-octane for the 5.7-liter V-8. The 6.4- and 6.2-liter engines would require 91-octane premium. Diesel engines need ultra-low-sulfur fuel. Probably not. Instead, product planners are likely working nonstop on the redesigned Grand Cherokee. For 2019, Jeep made blind-spot alert standard on all Grand Cherokee models. For ’20, we’d urge Jeep to make rear cross-traffic detection at least available on the Laredo; it’s been optional on the Limited, Trailhawk, and Overland, and standard on the Summit, SRT, and Trackhawk. Jeep has had a similar availability strategy for other driver-assistance features, including forward-collision warning with autonomous emergency braking designed to stop the Grand Cherokee automatically to mitigate a frontal collision, and adaptive cruise control to maintain a set distance from traffic ahead. All these features could well be made standard across the board on the redesigned 2021 Grand Cherokee. 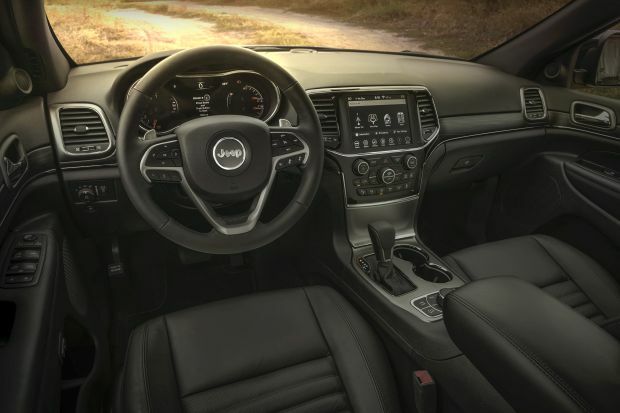 Among 2020 features expected to remain optional on the Laredo and standard otherwise are imbedded navigation with 8.4-inch touchscreen, satellite radio, power driver’s seat, heated front seats, and heated outboard second-row seats. Leather upholstery would return as standard on everything but the Laredo, with Trailhawk grades offering it as an option in place of a leather/suede blend. Ventilated front seats would be available on all but the Laredo and Trailhawk. A power tilt and telescopic steering wheel would be optional on the Limited and Trailhawk and standard otherwise. An Alpine- or Harman/Kardon-brand audio system would be available depending on trim-level selection. A panoramic sunroof would be standard on the Overland and Summit and optional on the Limited, Trailhawk, SRT, and Trackhawk. Jeep will likely keep price increases to a minimum, balancing the industry-wide demand for midsize crossovers with the need to move outgoing Grand Cherokees before the redesigned models land. For reference, we’re listing 2019 base prices, which include Jeep’s $1,495 destination fee. With rear-wheel drive, the 2019 Laredo starts at $33,190, the Limited at $40,440, the Overland at $47,240, and the Summit at $52,940. Choosing AWD or 4WD adds $2,300-$3,000, depending on trim-level selection. Among models that come standard with AWD or 4WD, the ’19 Grand Cherokee Trailhawk is priced from $45,540, the SRT from $69,640, and the Trackhawk from $88,145. We’d urge Jeep to simplify options prices, but part of Grand Cherokee’s appeal has been the ability to customize from a plethora of features and packages. One result is that option can cost different amounts based on trim level selection. A few of the highlights expected to return for 2020 are the Jeep Advanced Active Safety Group ($1,495), which includes autonomous emergency braking, adaptive cruise control, forward-collision warning, hands-free parallel parking, and rain-sensing windshield wipers. A power sunroof is $1,295, while rear Blu-ray entertainment is $1,995. Quadra Drive II is available on certain models as part of the $2,495 Off-Road Adventure II Package, which also adds underbody skid plates, limited-slip rear differential, upgraded suspension with rear load leveling, and a heavy-duty trailering package. Look for a 2020 Jeep Grand Cherokee release date in the fall of 2019.